We’ve used these flavors before in our Jarlsberg grilled cheese with shitake and arugula and they worked so well we reuse them quite often. 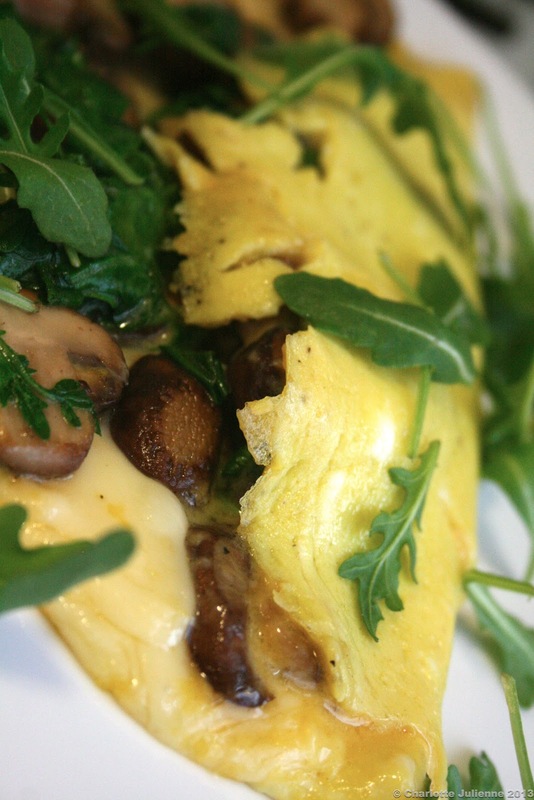 This time we decided to make an omelet using Jarlsberg, arugula and baby bella mushrooms. This omelet is a perfect choice for Easter morning and it is what we will be making tomorrow. We began with our simple ingredients of eggs, arugula, baby bella mushrooms and one of our favorite cheeses- Jarlsberg. We have recently discovered that you can purchase Jarlsberg at Costco in very large wedges. When we get them home we love to cut them into smaller wedges and vacuum pack them for easy access. To begin we sautéed the well seasoned mushrooms in a hot pan adding a knob of butter at the end. Once the mushrooms are nicely browned add a good handful of arugula leaves and remove from the heat so they are just wilted. You can set this mix aside and with a kitchen towel wipe out the frying pan to use for the omelet. In a bowl mix your eggs, salt, pepper and a good splash of heavy cream. Placing the pan on the heat, pour the mixture into a the pan which has a splash of olive oil and butter. It is important not to have the pan too hot as a good omelet should not have any browning and you are looking for that silky texture of just cooked. As the eggs coagulate and begin to set on one half add thinly shaved slices of Jarlsberg. A vegetable peeler is the perfect tool. Allow to melt for a minute or two. 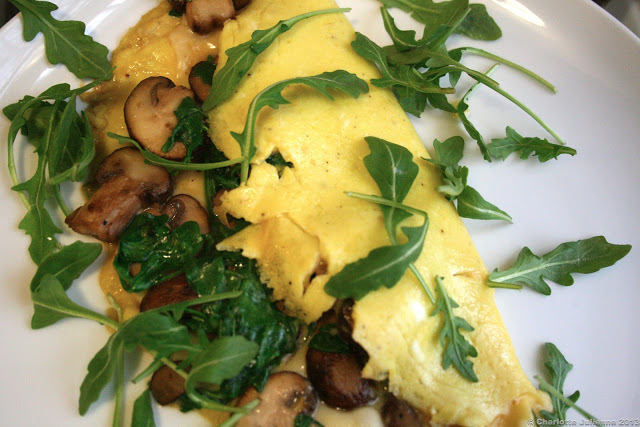 On top of the Jarlsberg place the sautéed mushrooms and wilted arugula then fold the other half of the omelet over the top and turn out onto a plate. Add a few fresh arugula leaves to the top. Enjoy this wonderful marriage of Jarlsberg, mushroom and wilted greens in a silky omelet.